Sat, 25 Aug 2012 | Published in I Was There . 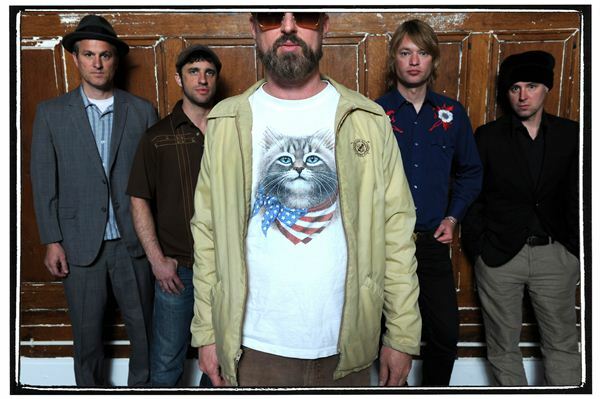 . .
Cake is a household name when it comes to American rock of the 90s and 00s. Clever lyrics, with blaring trumpets and steady guitar define their sound. Their tour brought them to Brooklyn’s newest outdoor venue, Williamsburg Park, for a midsummer night’s jam. Cake is doing this tour solo, busting out about two hours of music split with an intermission. This was my first time catching a show structured this way, and it was refreshing to focus entirely on one band for a night. Few bands I’ve seen could match the consistently high energy level of Cake performing for that length. What I most enjoyed from this show was the atmosphere. Good weather and sharp acoustics set a nice environment, but it was the strict no photo policy and mostly mature crowd with few talkers that made a pleasant evening. When Cake is focusing on the music, they’re in top form. Their choices of audience interaction are odd though. A tree was given away, which took a good twenty minutes for the crowd to guess its species and lacked no fanfare for its awarding either. That is certainly a unique gimmick, but not something I need to see again at a rock show soon. Set one by Cake was more oriented towards their newer music. It was odd that John McCrea, their frontman, spent plenty of time implicitly dissing their latest album, repeatedly joking about how they were done with it before doing another song from it. It comes off more depressing than lighthearted. Don’t bother playing the songs if you don’t think the audience wants to hear them! Their set one closer was the lead single off of their latest record, “Sick of You,” and it was made quite entertaining with a dueling audience chorus. Part two offered us more older tunes, but it was not until the encore that we got “The Distance” and “Short Skirt/Long Jacket.” Those songs made a great cap on a fun performance before exploring the Williamsburg nightlife.